As the current owner of the Pelikan #Wanderbox, you’ve got the unique chance to join in this project by writing a letter and posting it on your favorite Social Media site(s) with the hashtag #Wanderbox! Feel free to add a geotag or your current location. Then place your letter inside the box and pass it on. The next person in this chain should be someone you trust; someone who’s willing to write the next letter. 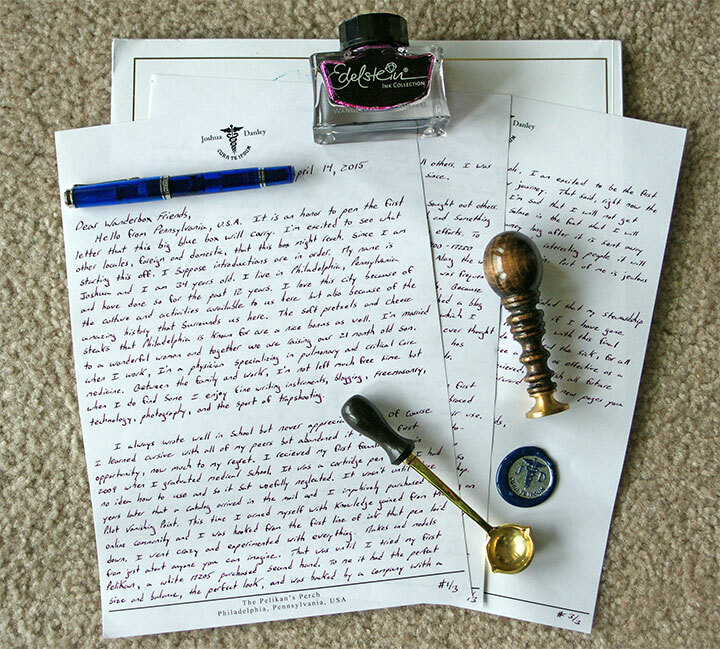 Earlier this month I wrote about Pelikan’s Wanderlust Project, a concept based around a joy of ink and fine writing instruments, married to social media (#Wanderlust). Three flacons of Edelstein ink were dispatched from Germany to travel the world in large blue boxes. Ultimately, 60 stops were chosen after a review of approximately 200 applications. Cumulatively, the three boxes visited 37 countries over 5 continents covering almost 112,000 miles, a journey that would roughly circle the world four times. The project began in 2013 and today Pelikan hosted an online celebration via Facebook (2pm-4pm UTC+01) in honor of the return home of those “blue boxes.” The letters written by each participant that were returned to Germany (57 in total) were posted individually to the event’s Facebook page along with many photos. The company posed various questions with each post and the letter’s authors were all invited to participate as well. If exploring those wasn’t enticing enough, Pelikan went even further by obtaining 22 sponsors from their pool of retail partners. These sponsors offered up several P200/P205 pens that were given away in a raffle to event participants based on comments left with each post. Over 600 people had affirmed their desire to attend on the event page ahead of the celebration and based on the languages and locations that I observed, it was truly an international event. Winners of today’s raffles will be announced tomorrow, 3/27. Forty years after the company that we know today as Pelikan came into existence, a new word of German origin came into use; wanderlust. Merriam-Webster’s dictionary defines wanderlust as a “strong desire to travel.” Perhaps not used as much in today’s vernacular, during 2013 the creative minds at Pelikan conceived an interesting idea for which that word was well suited. A project was born with strong ties to Facebook and social media which they dubbed “Pelikan Wanderlust 2013.” The original concept for this project was to send two bottles of Edelstein (pronounced EY-dell-shtine) ink around the world making stops along the way in the homes of different pen enthusiasts, collecting a hand written letter from each before moving on. Applications were solicited in order to select the participants with an initial vision of making 40 stops across the globe. Based on the feedback received, it was ultimately decided that three bottles would be sent instead of two thereby increasing the ground covered and making for a total of 60 stops. Those chosen to participate in this international tour of ink were notified in early August of 2013 and on August 30th the journey began. Travelling in special blue containers, the first bottle was personally delivered by the Pelikan team in Hannover, Germany. The other two began their trek via the post in Malaysia and Hawaii. This week has been very exciting as Pelikan rather unexpectedly announced two new pens to be released in 2015. The new products coming out of Hanover aren’t limited to pens though as they have also announced the Edelstein (pronounced EY-dell-shtine) 2015 Ink of the Year. 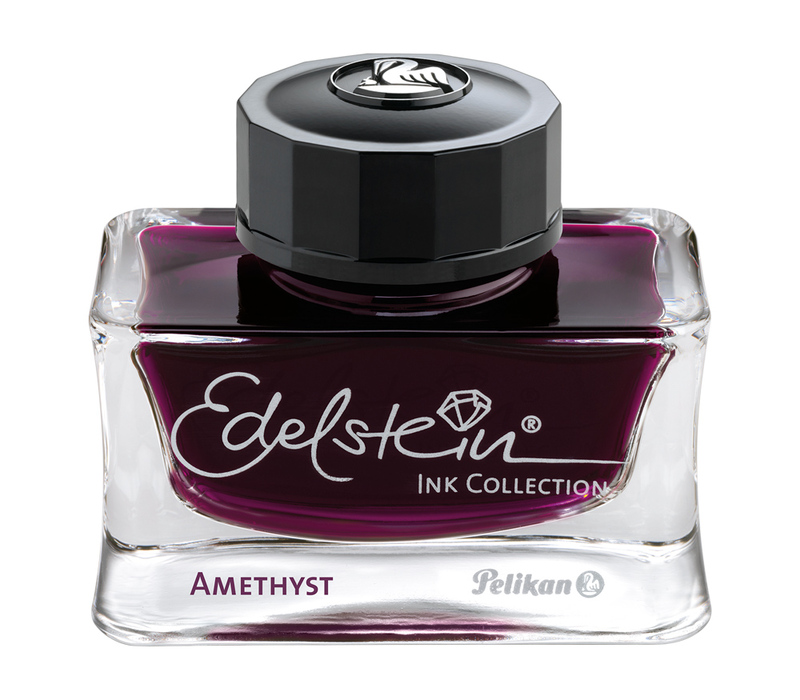 This upcoming year will feature Amethyst, marking the twelfth addition to the Edelstein line-up and the fourth Ink of the Year.